Last month when I was in Harrogate I had a free chunk of time before getting my plane to Belfast. Because of jet-lag I was a awake at 4.00 am wondering what I could do in Yorkshire before my 2.00 pm flight from Leeds-Bradford. 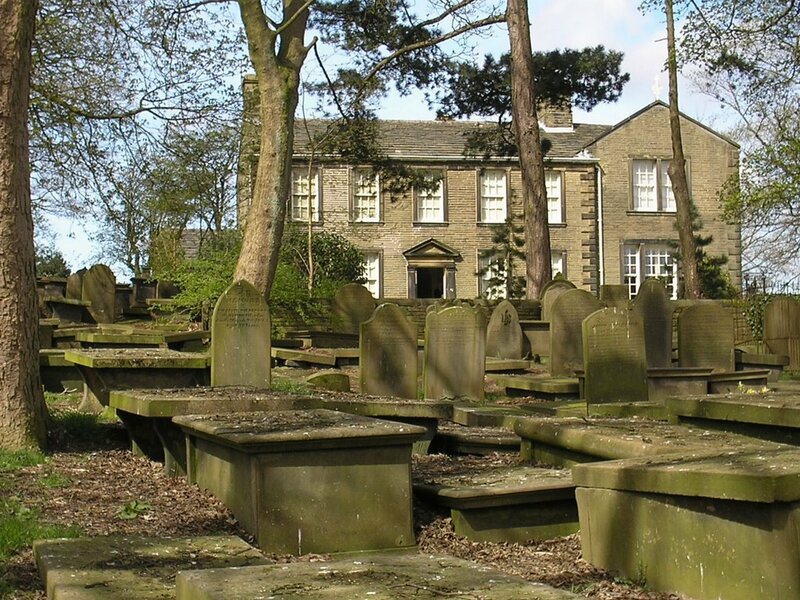 A bit of googling convinced me that I could pay a visit to the Bronte Parsonage in Haworth and still make my flight. Ergo: walk to Harrogate train station, train to Leeds, train to Keighley, bus to Haworth, walk up a very steep hill (with my dodgy knees) to the Bronte house. The parsonage is now a museum with a lot of Bronte memorabilia, replica desks and beds and furnishings. Most of the writing seems to have been done in the tiny front parlour where Anne, Charlotte, Emily and Branwell made up stories, did drawings and talked. It's an incredible sensation to be in that room where so much talent and creativity flowed. The museum has acquired both Emily's and Charlotte's portable writing desks (that one puts on ones lap or a table) and these are on display too. Haworth itself is a windy, hilly out of the way place. When I arrived at Keighley train station the temperature was 5 degrees Celsius and this was in high summer, so I imagine that in winter it gets pretty wet, cold and damp in those parts. The house where the Brontes lived looks like it was pretty cold too with thin walls, thin windows, an exposed location at the top of a hill and only smoky coal fires to heat it. It's no wonder, really, that TB in the pre-antibiotic age almost wiped out the entire family. The Bronte sisters tried various boarding schools but were always unhappy there and were mostly educated at home by their Ulsterman father Patrick. I asked someone at the Parsonage if the girls spoke with an Ulster accent or a Yorkshire accent (the accent in Keighley and Haworth is particularly strong) but they didn't know. Later I found this fascinating paragraph from Mick Armitage's website about Anne Bronte. The only reference to any verbal accent the Brontës exhibited was by Mary Taylor, another one of Charlotte's life-long friends, who declared that, when they first met at Roe Head School in 1831, Charlotte 'spoke with a strong Irish accent'. This accent was obviously acquired from her father, Patrick, who was of Irish descent. It seems logical to assume that Charlotte's accent would be echoed in Anne, and indeed her other siblings. However, as there are no other references whatever to their accent, it may not have been as 'strong', or 'obvious', as Mary Taylor suggests; alternatively, the Brontë children may have lost most of this accent during their youth. This is possible as Patrick is noted to have lost all his by 1853. Given that the siblings spent much of their childhood and youth under the care of Aunt Branwell, who was from Cornwall, it seems certain that they would have acquired some of her Cornish accent, not to mention the inevitability of adopting some of the local Yorkshire dialect from their servants and local acquaintances. In conclusion, their accent was probably a blend of all three - and one can only wonder what this sounded like.